These funky looking, saucer shaped, button like paper beads came from my sister Joann and will be including some in your kits. Yay! will be mailing the Paper Bead Trade kits on the 15th. 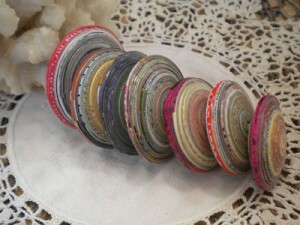 She tightly rolled strips of magazine paper in different size and thickness. There’s some really big ones. Kayla, incorporated it in a necklace that can be worn off on one side or the middle. 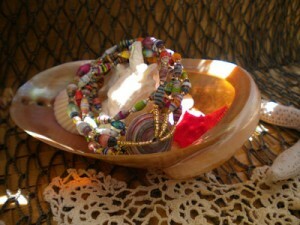 On one side, three strands of olive shaped paper beads are holding the saucer bead and on one side is just one strand. I have received Hilde and Tina’s paper beads for the trade yesterday and will be posting that, hopefully I will get the rest tomorrow and Tuesday. Do you have tutorial on how to make the saucer shaped beads? To get the circles of colors I’m guessing you used paper stock in yellow and then red and then blue to get a variety of color swirls… or are they painted? When I do magazine pages they aren’t very colorful. 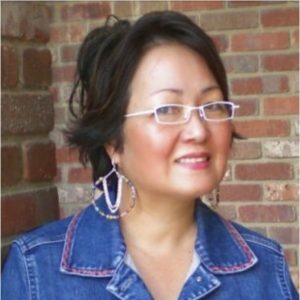 Your saucer beads are beautiful and a tallent! 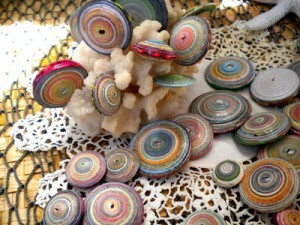 Please tell me how to purchase some of these big paper saucer beads. I’m going crazy over them! I’ve been trying for a month now and just can’t seem to purchase them. How do I do this? I’m so frustrated. Those are really neat! I can only imagine how long it takes to roll one of those! 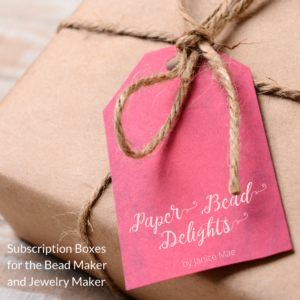 I will be mailing my paper beads out to you for the trade this Wednesday, July 14th since you indicated that we would have until the 15th of July to mail our beads for the bead trade to you. Is that still the case? I love them. Are the colors just natural from the paper or was it painted also? I am so looking forward to the wire wrapping. My paper beads might be a bit after Tuesday or today. But it will make it before the 15th. Is that okay? oh my gosh! 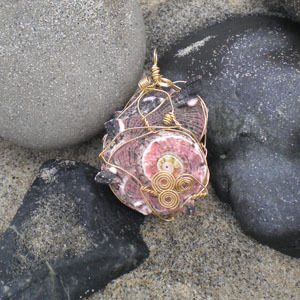 I’ve always wanted to know how to wire wrap, Looks hard, but would look very nice on a pendant! 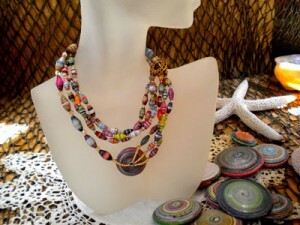 And those Saucer shaped beads are so awesome! I can’t wait for our kits.